Our researchers have classified Loztol.info as an adware server that could inflict major damage on your computer via corrupt advertisements. We recommend that you remove this infection from your computer as soon as possible in order to avoid unpleasant surprises that this infection is bound to deliver. This infection has been created only to annoy users with commercial advertisements supplied exclusively by various unreliable advertisers. this adware server has been associated with various malware infections and is regarded as a vehicle for distributing them, you should definitely remove it. You might get infected with Loztol.info if you download software bundles from websites, such as Malavida.es, Filewin.com, and Descargar.es. We recommend that you avoid downloading anything from the aforementioned websites as they might not only contain Loztol.info, but other more dangerous infections as well. However, we must inform you that you can opt out the installation of this infection when installing applications featured on these websites. Simply uncheck the checkbox when running the installation wizard to remove this adware server from the installation process. After entering Loztol.info, it will warn you that your media player may be outdated, and will offer you to install an update. We warn you that this advertisement is fake and you should not under any circumstances click the OK button. 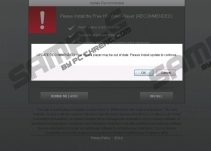 However, if you click it, the adware server will download and install adware applications and possibly other even more dangerous malware on your computer. In any case, adware itself is a source of infection, meaning that you might be redirected to an infected website which could infect you computer with malware, such as Trojans, rootkits, spyware, and so on. Note that you cannot remove malware such as Trojans using manual removal methods. You will definitely need some king of malware removal tool. All in all, this infection might seem irrelevant, but rest assured it would cause you a lot of problems. If, by any chance, you get your computer infected with Loztol.info related applications, then you might have to deal with very serious infections. Once again, we warn you that if you get infected with adware via this application, you will expose yourself to potentially dangerous ads that could redirect you to infected websites that could contain malware downloads. That is why we recommend that you remove adware server from your PC using our manual removal guide or an anti-malware scanner that will remove this infection altogether. Move your mouse cursor to the lower left corner of your screen and click Start Screen icon. Find any Loztol.info related applications. Move your mouse cursor to the lower left corner of your screen and click Start. Find Loztol.info related applications and click Uninstall. Move your mouse cursor to the lower left corner of your screen and click and open the Start menu. Disable/Remove the Loztol.info related extensions. Click trash can icon to remove the Loztol.info related extensions. Select Loztol.info related extensions and click trash can icon to remove it. Quick & tested solution for Loztol.info removal.